Watchable soapy melodrama enlivened by gorgeous photography and strong performances from all four leads, though the script veers dangerously close to laughable territory in places and it commits the unpardonable sin of side-lining Ben Mendelsohn. French director Anne Fontaine (Nathalie) makes her English language debut with Adore (aka Two Mothers), based on Doris Lessing's novella The Grandmothers. 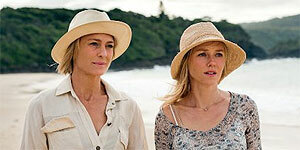 Set in a remote, idyllic Australian coastal town, the film stars Naomi Watts and Robin Wright as childhood best friends and neighbours Lil and Roz whose bond is strengthened still further when they both give birth to sons in the same year. When Lil's husband dies and Roz's husband Harold (Ben Mendelsohn) moves to Sydney to take a job, the women are left alone with their now nineteen-year-old sons Ian and Tom (Xavier Samuel and James Frecheville) and it isn't long before simmering lusts come to the surface: first Ian makes a move on Roz and then, discovering what Ian has done, Tom makes a move on Lil. Before long, both mothers are in transgressive, full-on relationships with each other's sons, but their situation is jeopardized a few years later when Ian meets a young woman (Jessica Tovey) at his job in the city. Watts and Wright are both excellent as the fiercely close best friends – there's a great scene where Harold asks Roz to choose between moving to Sydney with him and staying in their small town with Lil and she looks at him like she doesn't even understand the question, so obvious is her choice. Samuel and Frecheville are equally good in support, generating strong, convincing chemistry with both women – the lusty looks around the dinner table telegraph the action early on, so it's a little like watching a car crash in slow-motion. The film is also beautifully shot, courtesy of cinematographer Christophe Beaucarne, who makes strong use of the film's idyllic coastal locations – indeed, the location plays a crucial role, because it's easy to understand the foursome's mind-set, that the outside world can't bother them in this beachside paradise. Despite the film's intention to play it straight, this is seriously soapy stuff and the dialogue veers dangerously close to laughable territory in places, particularly with on the nose observations like “We've crossed a line here.” That said, at least the script has the courage of its convictions and explores the idea of its unusually transgressive relationship, rather than copping out. A bigger problem is that the film makes the baffling decision to side-line Mendelsohn early on, even denying him a reaction scene to the initial betrayal. It also fails to properly explore the mother-son-lover conflict, despite a potentially promising scene where both boys get injured and the mothers run to their lovers, rather than their sons (a moment of indecision would have gone a long way here). Despite some dodgy dialogue issues, Adore is an enjoyably soapy, beautifully shot melodrama with strong performances from all four leads.